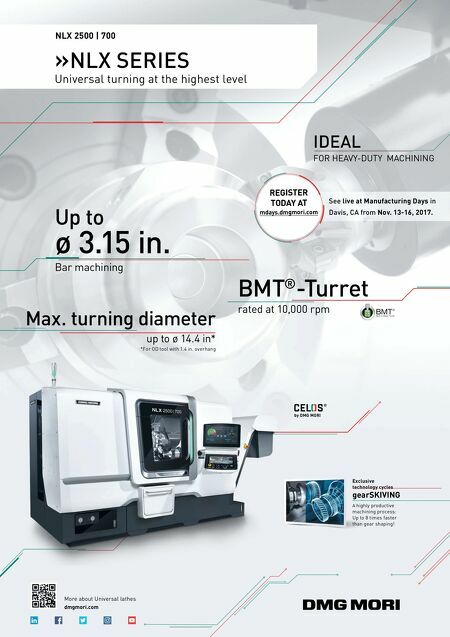 62 MMS October 2017 mmsonline.com CNC TECH TALK Columnist As manufacturing continues to rebound in the United States, companies are finding it more and more difficult to find and hire qualified CNC pro- grammers and operators. Your obvious goal during the hiring process is to secure the best applicant from a pool of available candidates, at the wage your company is willing to pay. If you have not done so already, you should create an interview process for use in hiring people to program, set up and run your CNC machines. This will ensure fairness to the applicants while keeping the process logical and consistent. There are countless online resources that can help you develop such a procedure, but there are several areas in particular that you will want to address. A good hiring process will assess applicant attributes that include dependability, motivation, aptitude and proficiency. The first three are rather subjective qualities and dif ficult to accurately evaluate during a short interview. There are as many techniques to evaluate these qualities as there are applicants. Again, many online resources offer suggestions that should help. Proficiency, on the other hand, should be rela- tively easy to assess. It is simply a person's current knowledge and ability in a field of endeavor. Frankly speaking, however, proficiency is not the most important of the attributes. I would rate it well after the applicant's eagerness (motivation) and ability to learn (aptitude). Additionally, you should be prepared for how to evaluate applicants who freely admit to having no previous experience perform- ing required tasks, yet score well in other areas. When an applicant does claim to have experi- ence, you must confirm this claim. You must provide some way for him or her to demonstrate his or her knowledge and ability level. If you fully understand the required tasks, you may be able to assess an applicant's experience level by simply asking a few pertinent questions and gauging the quality of his or her answers. If you do not fully understand the tasks required for your open position, you will need some help. Managers and lead workers in the area/depart- ment that is looking to hire should be able to come up with a variety of real-world challenges that its workers regularly face. I recommend combining physical tasks with a test to gauge an applicant's proficiency. The physical tasks should parallel methods your staff is currently using, and examples include: • Use of variable and fixed measuring tools like micrometers, calipers and go/no-go gages. • Use of common hand tools. • Use of deburring tools. • Use of applicable computer programs. The test could be handwritten or computer- generated. It should be developed by or with the help of managers in the department that needs the new staff. Be careful not to include company- specific terminology or methods. Doing so may cause an applicant with good experience to score poorly simply because he or she does not under- stand your company lingo. 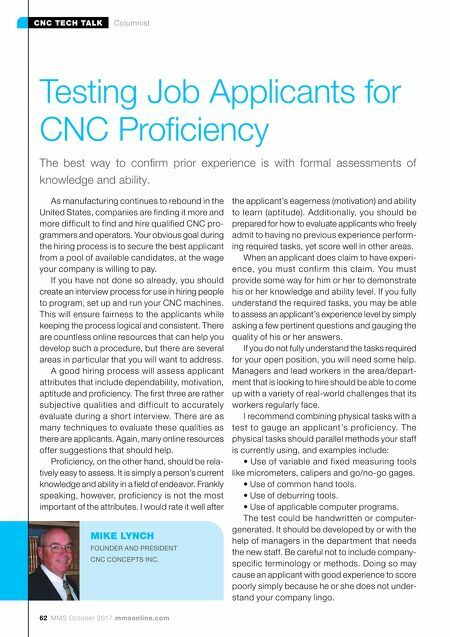 Testing Job Applicants for CNC Proficiency The best way to confirm prior experience is with formal assessments of knowledge and ability. MIKE LYNCH FOUNDER AND PRESIDENT CNC CONCEPTS INC.